Cursive writing is an art form. Simply put, it is a tool to communicate with others. As an elementary student I hated cursive writing, as I was usually rushed and had no idea of the importance cursive writing held in my life. In University, I quickly reverted back to printing with colourful pens, highlighters and colour coded studying systems. Now, as a Vice Principal, I cursive write all of my notes, I using my cursive skills to sign newsletters, letters to parents and official documents daily. Look at your child. Are they a pre-teen, teenager, or older student off to further their educational pursuits in 2015? Now ask yourself, can your child sign the documentation needed to apply for a loan sign rent cheques or a summer job contract? What if your young adult is heading to Europe for a pre-Universtiy experience and needs to update their passport, are they able to create a legible signature for the application? Legal documentation still needs to have a signature, however, if your child has a printed signature is very easy to forge. When I taught in the primary division, I found students with poor fine motor skills, benefited from practicing cursive writing skills. I also found for those “fast finishers” cursive writing lessons were a positive and artistic activity they could complete while the rest of the class worked. Cursive writing, is included in the Ontario Language Curriculum document and it is still part of the curriculum in some US school district. However, I have taken the time to use cursive writing programs to help my children learn how to read and write in both writing forms at home. Currently, AndiePandie can read and write, KT can write and Beckett has no cursive writing skills, but I am working on it. One of the most comprehensive papers I have read and used when determining where to begin teaching cursive writing with my students and my own children was written by Diane Matthews & Tami Folks both of Orange County Florida. Write It Down does not give actual cursive wiring lessons, but observational cues to be aware of when determining what issues your child is having or where to begin when helping your child cursive write. There are many paid programs you can purchase, but one my favourite free program is simply called Cursive Writing Worksheets. 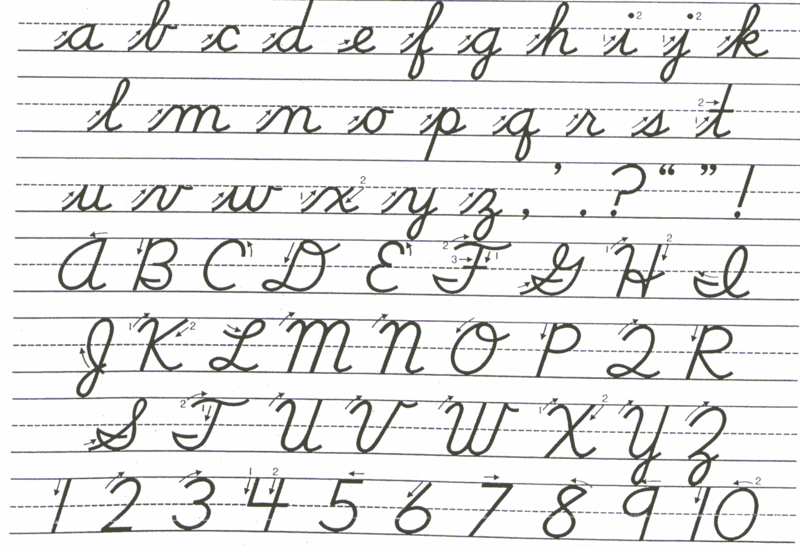 Cursive writing is a life skill that my children will never regret learning. It is not high on their priority list of important life skills, but in the end I am sure they will thank me.